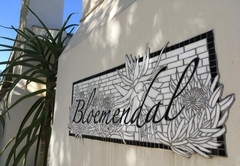 Bloemendal Guest Cottage is a property providing self catering in Riebeek Kasteel for up to 4 guests visiting the Swartland region. 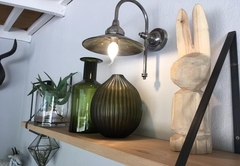 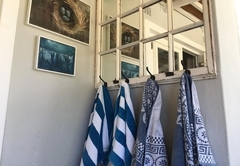 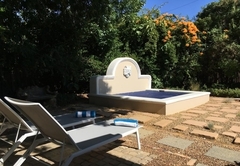 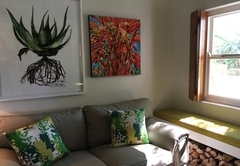 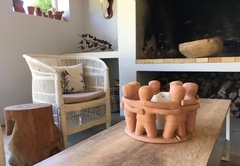 Bloemendal Guest Cottage is a lovely self catering Cottage situated in the Riebeek Kasteel valley a mere hour and a half drive from Cape Town. 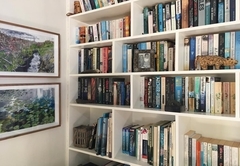 The cottage is ideally suited to self catering stays of varied lengths. 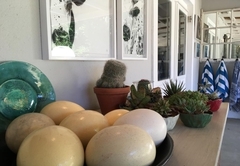 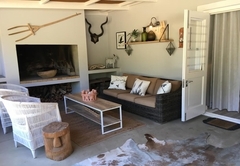 This is certainly a home from home and is the most relaxing and comfortable place to come back to after a lovely meal at a local restaurant or a day exploring the area, shopping or wine tasting. 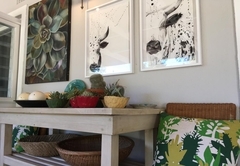 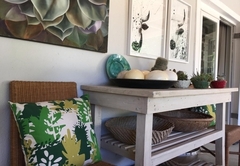 Decorated in calming colours with magnificent art works from the owner’s private gallery, this cottage has everything you need for a tranquil getaway. 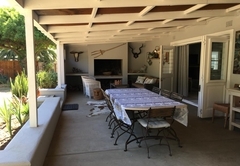 The lengthy veranda is home to a lovely outside fireplace / braai and is kitted with an eight seater wrought iron table and a comfy couch, making even chilly winter evenings cosy. 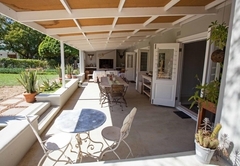 From the entrance you step into a large open plan lounge, dining room and kitchen. 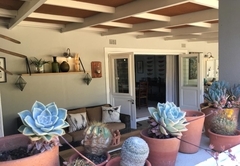 Wide stacking doors separate the outside from the living area, creating an inside / outside flow. 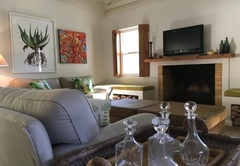 The lounge is furnished with deep, comfortable couches and has a flat screen TV with a DVD player. 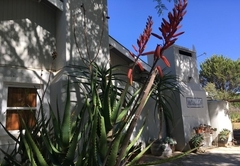 There is a DStv decoder available but you will need to bring your own card. 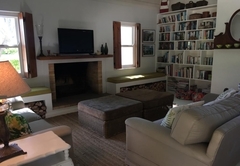 The big indoor fireplace is ideal for those cold nights when you want to snuggle on the couch with a movie. 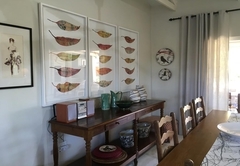 The eight seater dining room table allows yet another chance for family and friends to enjoy a great home cooked meal together. 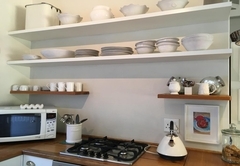 The kitchen is fully equipped and contains a gas hob with electric oven, microwave, kettle, toaster and coffee machine. 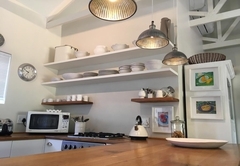 There is a washing machine and dishwasher in the scullery next to the kitchen. 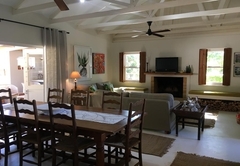 All entire interior is double insulated and fitted with ceiling fans, making it lovely and cool in summer. 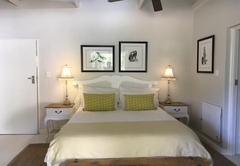 The cottage contains two bedrooms, both with queen sized, extra-length beds, and dressed in quality linen and fluffy pillows. 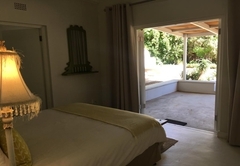 The main bedroom has double doors onto the patio area and an en suite bathroom with both a shower and a bath. 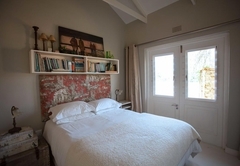 The second bedroom also has double doors leading to the back garden and the use of the second bathroom with a shower. 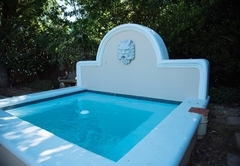 2 bedroom cottage with queen size beds, and en-suite bathrooms. 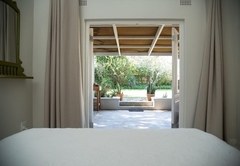 luxury pure cotton linen, down pillows and duvets. 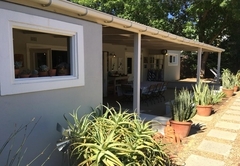 Full DSTV available. 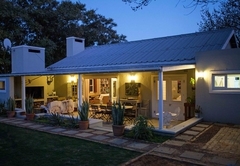 Response timeBloemendal Guest Cottage typically responds to requests in 5-10 minutes.